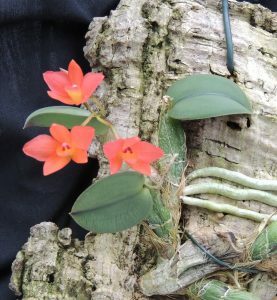 This is a Brazilian miniature species until recently known as Sophronitis cernua. It is native to South Eastern Brazil where it is found as an epiphyte in warm woodland close to the beach or further inland. We find that it does best when mounted on cork and completely free of moss so that it dries out completely between waterings. We grow plants in Warm Americas (min 15C) in good light. The plant shown here was split twelve months ago and is already producing an extensive root system well suited to a dry habitat. The flowers are quite small at 25mm across but a mature plant is covered in flowers and really gives a good display.